he Loire is perhaps the most diverse and certainly geographically the most extensive of all France’s classic wine regions. Inevitably there is a vast difference in styles from Nantes on the Atlantic coast to the heart of the Auvergne. The Loire drains tow thirds of France and its source is only around 100 kilometres north of the Mediterranean. The Loire’s most southerly vineyards in the Côtes de Forez are on the same latitude as Côte Rotie to the south of Lyon. Much of the region is steeped in tradition but, while you won’t find the wave of new developments that is happening in the Midi for instance, there are new high-quality producers emerging in almost all appellations. A number of them are committed to either organic farming practices or indeed biodynamic viticulture. Applying these principles in this northerly climate is a far taller order than in, say, dry and sunny Provence. The Loire is prone to spring frosts usually in April – sometimes with devastating consequences. The worst in recent memory was in 1991 when production overall was just a third of normal. 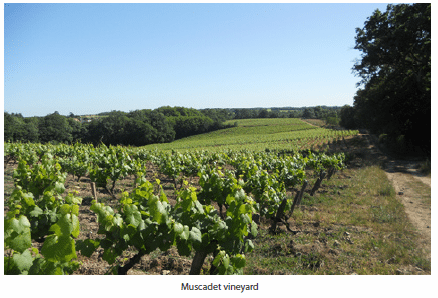 Other years with significant frost damage include 1994, 2008, 2012 and 2016.
of people: Muscadet, which was hugely popular in the UK until the devastating 1991 April frost. This coincided with the arrival of the influx wines from the southern hemisphere, in particular Australia. Inevitably Muscadet has never recovered the market share it enjoyed in the 1980s and the region has been through tough times. There has been a substantial reduction in the area planted with Melon de Bourgogne – over 13,000 hectares at its height but now down to around 9000 hectares. This is still a big area and one of France’s largest appellations. Although there were always quality producers like Domaine de l’Ecu, Louis Métaireau, Château de Cléray and Domaine Luneau-Papin, the overall standard has improved greatly and now some of the best value French whites come from here. The new crus communaux, with their long lees aging, are particularly exciting offering new levels of complexity. Côtes de Grandlieu. Good Muscadet can be crisp, minerally and with a real green-fruited depth, not dissimilar to sound village Chablis. Good Muscadet also has the potential to age for several decades. Covering the same area is the Gros Plant AOP, producing simple, quite austere wines that are a perfect match for oysters. To the south is the Fiefs Vendéens – you are most likely to encounter these on holiday in the area. However, there are a few exciting, high quality producers here – Domaine St Nicolas, Mourat and Prieurie de Chaume (check). The range of grape varieties used includes Chenin Blanc, Chardonnay, Cabernet Franc, Pinot Noir and a curiosity – Negrette otherwise found much further south in France in Fronton. The Anjou appellation includes red, rosé and white wines. Theoretically it covers a large area mainly to the south of the River Loire, from the west of Angers east to beyond Saumur and the boundary with Touraine. In practice producers in the Saumur region uses Saumur appellations rather than Anjou. There is a considerable range of quality, although fortunately the leading négociant companies like Ackerman and Les Grands Chais de France have upped their game. Increasingly they take responsibility for vinifying their wines giving them greater control over quality. the major white variety of the region, Chenin Blanc. Some appear under the rather discredited Anjou Blanc appellation, while others from producers like Richard Leroy and Mark Angeli opt for the simple Vin de France category. There is a move to try to create a Chaume appellation for dry whites to give dry whites from this part of the Layon increased credibility. Those from the Côteaux de l’Aubance tend to be a little less rich at the top end. There are, however, some good examples, which like those from the Layon have the potential to age for several decades and more . Rosé is an important category here. There are three types – Rosé de Loire (dry), Rosé d’Anjou (medium dry- medium sweet) and Cabernet d’Anjou (sweet). The permitted grape varieties for Rosé de Loire are Cabernet Franc, Cabernet Sauvignon, Grolleau, Pineau d’Aunis, Gamay et Côt (Malbec). This rosé can be made throughout Anjou-Saumur and Touraine. In practice, however, most is made in Anjou often using a majority blend of Grolleau and Gamay.. These days the oft-reviled Rosé d’Anjou, with a required majority of Grolleau, is often well made – it does what it says on tin even if it isn’t to everyone’s taste. In the past Cabernet d’Anjou was an ageworthy rosé with still drinkable examples dating from vintages like 1945, 47 and 49. Nowadays Cabernet d’Anjou is made for pleasant, early drinking with an emphasis on red fruits. Reds from Anjou tend to be more tannic from the schist and slate soils here than those from the limestone vineyards of Saumur and Western Touraine. Careful use of extraction and tannic management is essential if these reds if mouth-puckering tannins and sharp acidity are too be avoided. It is not unknown here for the most rigorous growers to pick selectively going through their vineyards twice to pick only properly ripe grapes. Anjou Rouge should be for easy and early drinking with an emphasis on the fruit. Cabernet Franc, Cabernet Sauvignon, Gamay and Pineau d’Aunis are the permitted grape varieties. Anjou-Villages should be more structured with only Cabernet Franc and Cabernet Sauvignon allowed. It is not allowed to bottle this red early and can only be bottled after the 1st September following the vintage. The Anjou Villages Brissac appellation is restricted to the ten communes around and including Brissac-Quincé. It covers the same area as for the Coteaux de l’Aubance. It is only in Anjou that Cabernet Sauvignon can be successfully ripened and then only in particularly good parcels. The best known nearly pure Cabernet Sauvignon is Croix de la Mission from Domaine des Rochelles. It includes 10% Cabernet Franc and can age very well. Although there are some good and ageworthy examples of Anjou Villages and Anjou Villages Brissac it is rare for the reds of Anjou to have the finesse of those from Saumur and Western Touraine. There is also a separate appellation for Anjou Gamay. Production is small with most of it is sold in the local market as Primeur in mid-November at the same time as Beaujolais Nouveau. It is worth looking out for juicy, black-fruited Grolleau, from producers like Château de Breuil and Topette from Domaine de Bablut (includes some Cabernet Franc) sold as IGP Val de Loire. Between Anjou and Saumur there is an important change of rock type. For much of the Pays Nantais and Anjou it is the hard, impervious rock of Brittany – granite, slate and schist. This gives way to the clay and porous limestone of the Paris basin that stretches from Saumur right through to Pouilly-sur-Loire. In Anjou underground cellars are few and far between because it is difficult and expensive to excavate the hard rock, whereas from Saumur eastwards there are hundreds of kilometres of underground cellars along with troglodyte houses built into the rock a feature of valley landscapes. The change of rock makes a difference to the wine – whites from the clay limestone tend to be a little more acidic, while reds usually have softer, less marked tannins. Saumur is the centre of the Loire’s sparkling wine industry with several well-known houses such as Ackerman, Bouvet Ladubay, Gratien et Meyer (owned by Henkell) and Langlois Chateau (owned by Bollinger). For years Saumur Mousseux was the main appellation but Crémant de Loire (created in 1975) has gradually become increasingly important until the production of Crémant now just exceeds that of Saumur. Annual production of Saumur Mousseux is around 11.25 million bottles, while Crémant is now about 12.1 million bottles. However, although the majority of Crémant is made in the Saumur region the Crémant de Loire appellation covers not only Saumur but also Anjou and Touraine. Apart from the bubbles Saumur is now best known for its reds from Cabernet Franc. It is the western part of the Kingdom of Cabernet Franc that includes Bourgueil, Saint-Nicolas-de-Bourgueil and Chinon in nearby Touraine. This is the world’s largest concentration of quality Cabernet Franc. Saumur-Champigny is the best-known appellation here – ranging from young easy drinking cuvées to more structured wines that can age beautifully for several decades. Over the past 25 years there has been a revival of interest in and the production Coteaux de Saumur – a sweet, late harvest wine made from Chenin Blanc. It tends to be lighter than those of the Coteaux du Layon with attractive citric notes. Like other sweet Loire wines it has an excellent capacity to age. As in Anjou there is a catch all Touraine AC that encompasses most of the region and covers all styles of wine including sparkling. However, quality minded producers here often opt to make Crémant de Loire because of its its stricter regulations and more up-market image. Sauvignon Blanc is the important variety for whites here, especially east of Tours. The Touraine appellation stretches from Candes Saint-Martin in the west to Soings-en-Sologne in the east. The Cher Valley to the east of Tours is the most important area. Traditionally Touraine has been a melting pot for grape varieties with a wide range planted – the crossroads between those of the western Loire – principally Cabernet Franc and Chenin Blanc – and those of the east – Sauvignon Blanc, Gamay, Pinot Noir and Côt (Malbec). Unfortunately recent reform to AC Touraine has attempted to restrict producers’ level of choice. This has mainly been determined by the varieties that dominate in the eastern part of the appellation. Under the reforms 100% Cabernet Franc and 100% Chenin Blanc are no longer allowed. This ignores the reality in the western part of the appellation around Chinon where Chenin and Cabernet Franc are the principal varieties. AC Touraine white can only be made from Sauvignon Blanc or a blend of Sauvignon Blanc and Sauvignon Rose (locally called Fie Gris). Previously 100% Fie Gris was allowed – rightly as plantings of this variety in Touraine predates Sauvignon Blanc. Touraine Rosé is supposed to be made from at least three varieties where previously peppery Pineau d’Aunis has been a popular and attractive choice. This idiotic reform, however, has yet to be implemented. Initially it was due to come into force in 2016 but it has been deferred. There are several Touraine ‘villages’ appellations. These wines are not necessarily better than the best of straight appellation Touraine. Touraine Mesland has all three colours: red – Cabernet, Côt, Gamay; rosé – Gamay; white – Chenin Blanc. Touraine Amboise is again red rosé, white with a similar palette of varieties. Whites are exclusively from Chenin Blanc while Gamay, Cabernet and Côt are for rosé and red. Touraine Noble-Joué and Touraine Azay-le-Rideau (white – Chenin Blanc, rosé – mainly Grolleau plus Cabernet, Côt and Gamay ). Noble-Joué is an interesting rosé made from three Pinots – Gris, Meunier and Noir. Touraine-Amboise is expected to be promoted to Amboise in 2017 for white (Chenin Blanc) and red (Côt). There are two recent ‘villages’ creations: Touraine-Oisly (white – exclusively Sauvignon Blanc, Touraine Chenonceaux (white – exclusively Sauvignon Blanc; red – Côt, Cabernet Franc). In the far west of the region are the red wine appellations of Bourgueil and Saint- Nicolas-de-Bourgueil north of the river Loire and Chinon just to the south mainly in the valley of the Vienne. Cabernet Franc is the chief grape variety. There is also a small amount of white Chinon made exclusively from Chenin Blanc. 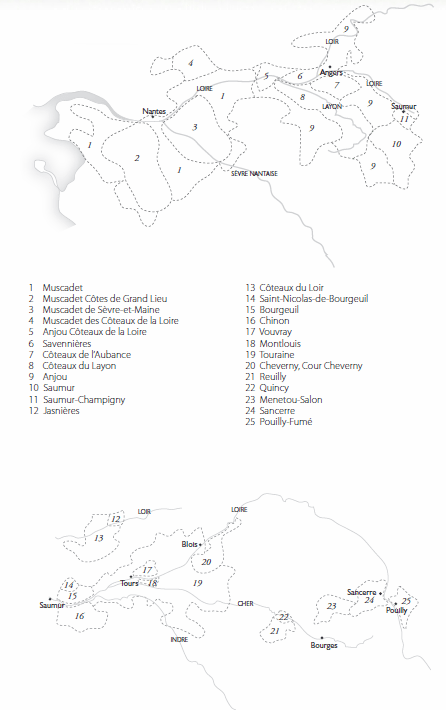 The style of these wines very much depends on whether the vines are planted on sand, gravel or the limestone coteaux. Wines from sandy vineyards are the lightest, those from the gravel of medium weight while those from the limestone coteaux are the most structured and remarkably ageworthy. Hidden away in some growers’ cellars there are still a few rare and drinkable bottles from 19th Century! The best of these wines are very good indeed with many of the top wines matured in oak often using barrels between 400-600 litre to avoid over-oaking. Bourgueil tends to be the most full bodied, while Saint-Nicolas can show show greater elegance and Chinon grown on the limestone côteaux is equally refined. In practice the differences between the soils and the quality of the producers is more often marked than the appellations. Just to the east of the city of Tours are the vineyards of Vouvray and Montlouis using Chenin Blanc. Vouvray allows 10% Menu Pineau but it is rarely used. Vouvray is on the north of the Loire, Montlouis just to the south between the Loire and the Cher. Depending on the vintage conditions – dry, demi-sec and moelleux styles are all made. The latter can be some of the greatest and longest-lived sweet wines in the world. Green and minerally in their youth, the dry and medium styles become increasingly rich and honeyed with age. The dry styles can be very austere when young and the searing acidity can be almost overwhelming. This can be the same with the moelleux wines – it’s just better disguised by the residual sugar. Like many of the sweet wines along the valley the dependence on liberal sulphur additions has been waning and you don’t need to wait 20 years now for it to dissipate. Around 60% of the production of Montlouis and Vouvray is bottle fermented sparkling wine. The difference – 65 hl/ha for sparkling against 52 hl/ha between the yields allowed for sparkling wine and still is a strong incentive to make fizz. However, it is also true that some of the best Loire sparkling wines are made here. Both appellations make fully sparkling as well as pétillant, which has up to 2.5 bars of pressure. Montlouis/Vouvray Pétillant is often finer than the fully sparkling version. Since 2007 Montlouis also has pétillant originel with only one fermentation allowed plus a ban on the use of enzymes, chaptalisation and added yeasts. To the north of Tours and the Touraine appellation are the regions of the Côteaux du Loir and its sub-region of Jasnières, which is exclusively Chenin Blanc. The climate here is extremely marginal and now apart from a small vineyard near Caen, France’s most northerly vine growing area in Western France. The best wines – dry and late-havested Chenin Blancs – are Jasnières from vines planted on south-facing aspects with a protected mesoclimate. Pineau d’Aunis plays an important part in the red Côteaux du Loir. Although a small area, there are now some dynamic producers here making some very good wines. A little further east in the valley of Le Loir is Coteaux de Vendômois making wine in all three colours. To the south of Blois are the regions of Cheverny and Cour-Cheverny. The permitted red/rosé varieties are Gamay, Pinot Noir, Cabernet Franc and Pineau d’Aunis, while Chardonnay, Chenin Blanc and Sauvignon Blanc are the white varieties. Cheverny has to be a blend. In white Sauvignon Blanc is the predominant variety complered by Chardonnay. Cour-Cheverny is a white-only appellation centred on the town of Cheverny and is exclusively for the unusual Romorantin grape. Romorantin gains considerable complexity with three or four years and more in bottle. The small appellation of Valençay adjoins the eastern extremity of generic Touraine. Although all three colours are made, red is dominant and can be made from Côt, Cabernet Franc, Cabernet Sauvignon, Gamay and Pinot Noir. For rosé Pineau d’Aunis is also permitted. The whites are mainly Sauvignon Blanc with Chardonnay and Arbois also allowed. The wines are pleasant but not memorable. A little under 100-kilometres south of Tours and just to the north of Poitiers is the appellation of Haut-Poitou, where there are some interesting whites and reds in vineyards to the north of the town of Poitiers around the small town of Neuville de Poitou. Production used to be dominated by the Cave Cooperative of Haut-Poitou, However, that is now bankrupt and the largest producer is the organic Ampelidae. The Central Vineyards are undoubtedly France’s and perhaps the world’s Kingdom of Sauvignon Blanc. Although there are now some very good reds being made here, from Pinot Noir, Sauvignon Blanc is the dominant variety and has been since the recovery from phylloxera early in the 20th century. Prior to that Sancerre predominantly produced red wine, especially from Pinot Noir and Gamay. Sancerre is the largest, best known and scenically the most spectacular appellation. Around 80% is planted with Sauvignon Blanc and 20% Pinot Noir for red and rosé. There are three types of soil: caillottes (limestone), terres blanches (clay limestone) and silex (flit). Early drinking wines tend to come from caillottes and the longest-lived from terres blanches, often steep slopes. There are some disappointing Sancerres, partly due to being bottled too soon after vintage, the leading producers are admirably keen to continue to improve their wines. Top white Sancerre, whether made in stainless steel or fermented and aged in wood has the capacity to age well – certainly 10 to 15 years or more. Over the last 20 years the quality of the reds has improved greatly as yields have been cut and growers have become more ambitious. The small town of Pouilly-sur-Loire, on the east bank of the Loire, is administratively in Burgundy. It is also the midway point of the Loire’s 1000 kilometre (600 mile) journey. The Pouilly-Fumé appellation (100% Sauvignon Blanc) is about half the size of Sancerre, while AOP Pouilly-sur-Loire is for Chasselas. In 19th Century Pouilly was famous for supplying Chasselas to Paris as an eating grape. Only about 30 hectares remain – a pleasant curiosity. Top Pouilly-Fumé is on a par with Sancerre, while tending to be a little softer and rounder with the potential to age well. Côtes de la Charité is a small IGP area south east of Pouilly-sur-Loire and east of la Charité. It is mainly planted with Chardonnay and Pinot Noir producing good quality wines. The most significant owners come from Pouilly-sur-Loire and Sancerre. There are two very small appellations around Orléans – Orléans and Orléans-Clery. Orléans-Clery is reserved for reds from Cabernet Franc. It is quite ambitious to hope to always ripen Cabernet Franc this far east. Orléans white is mainly Chardonnay with some Pinot Gris also allowed. The rosé is mainly Pinot Meunier with Pinot Gris and Pinot Noir also permitted. Red is again mainly Pinot Meunier with some Pinot Noir allowed. Menetou-Salon is contiguous with the western extremity of Sancerre. Just over 450 hectares the vineyards (Sauvignon Blanc and Pinot Noir) are more scattered mainly around the small towns of Morogues and Menetou-Salon. There are a number of high quality producers here. Quincy and Reuilly are two small appellations in the Cher Valley close to Vierzon, a railway and motorway junction town. Both appellations virtually disappeared during the 1960s/70s but started to revive from the 1980s. Only Sauvignon Blanc is permitted in Quincy producing some attractive citric wines from gravel soils but rarely with complexity of top Sancerres. Reuilly makes wine in three colours: Sauvignon Blanc, Pinot Gris for rosé and Pinot Noir mainly red. There are some good quality producers here. Although Pouilly-Fumé is the end (or the beginning depending how you look at it) the internationally known Loire vineyards, there are a number of scattered appellations in the Upper Loire producing some increasingly good wines. Gamay and Pinot Noir are for red and rosé. As in a number of other Loire appellations 100% Pinot Noir has not been permitted since Châteaumeillant became an appellation controlee in 2009. Châteaumeillant is very close to the centre of France and makes red and rosé from Gamay with some Pinot Noir allowed. Undergoing a renaissance with Quincy producers buying vines here. Saint-Pourçain, to the north of Vichy, has wines in all three colours. Grapes for the white are the local Tressalier and Chardonnay with Sauvignon Blanc also permitted. To the south is the Auvergne. There are now some very good red wines coming from both the Côte Roannaise, to the west of Roanne, and a little further south in the Côtes du Forez. Gamay is the variety here. Not surprising as the Beaujolais is not far to the east. There are also some excellent IGP whites from producers in the Roannaise and Forez using a range of grapes including Roussanne, Viognier and Aligoté. The choice of Roussanne and Viognier may appear surprising but Forez is south of Lyon and on a line with the northernmost vineyards of the Northern Rhône. To the west are the scattered vineyards of the Côtes d’Auvergne to the north and south of Clermont-Ferrand. Prior to the arrival of phylloxera in the second half of the 19th century, the Auvergne was France’s third largest vineyard – 45,000 hectares in 1890. The grape varieties used are Chardonnay, Gamay and Pinot Noir. Under appellation rules 100% Pinot Noir is not permitted, which is unfortunate as some Pinot Noirs I have tasted suggests that these could potentially be among the best reds of the appellation.